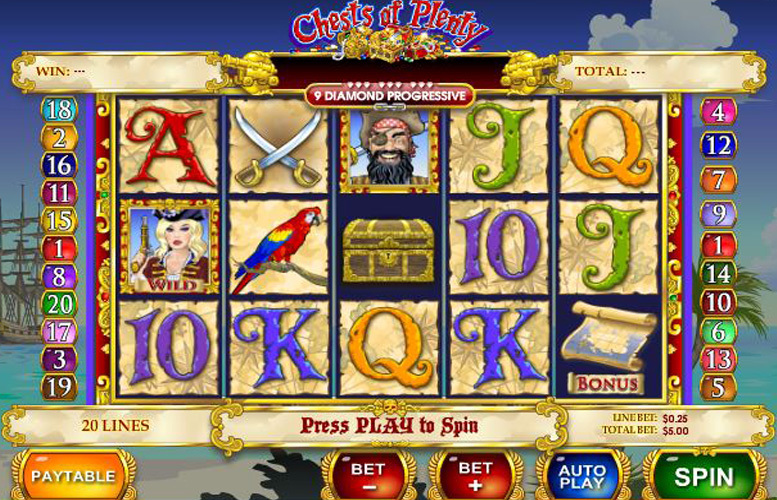 Thanks to their obsession with treasure, pirates are ideal inspiration for slot games and Chests of Plenty is a five reel, three row and 20 payline example which takes place on a trio of treasure islands in the company of a cutthroat crew. Boasting reels populated by symbols immediately recognisable as being pirate themed, the slot also includes not one but two treasure themed bonus features, both of which are triggered by different scatter symbols. The Chests of Plenty slot is linked to a progressive jackpot which can provide a lucky player with a truly life-changing sum of money. The pirate theme is utilised well to produce two fun bonus features which introduce both extra fun and enhanced winning potential to the equation. Wild symbols which can transform adjacent symbols into wilds too, help to boost the potential of winning combinations. Chests of Plenty payline jackpots are relatively low when compared with those available from other similar slots. Only a small selection of line bet options are available, meaning that players have comparatively little control over their stake amount per spin. 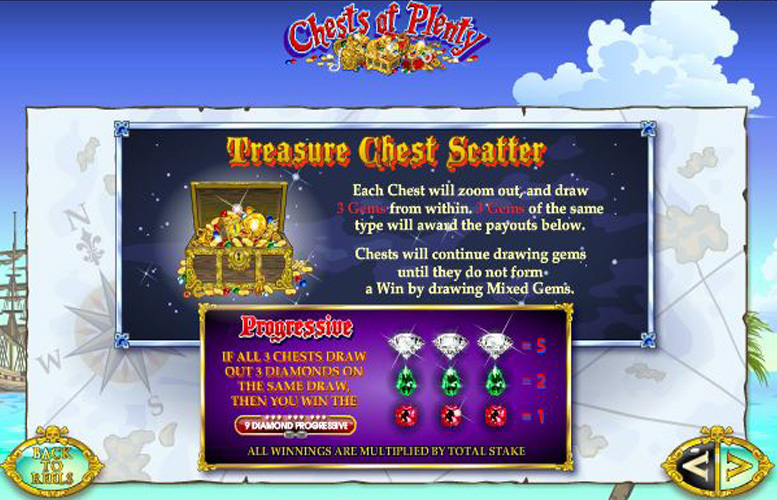 If a Chests of Plenty player wants to feel like they’ve truly uncovered buried treasure, they need to see five matching symbols line up along on of the slot’s active payline. If the symbol in question is the female pirate wild, too, the jackpot which they will trigger will be the largest available. Five of the female pirate wilds on a payline, after all, trigger a payout worth an impressive 10,000 times the player’s chosen line bet. As the highest possible line bet amount is just £2, however, that equates to an overall top available jackpot of £20,000. In order to make its gameplay a little more unique and to add extra ways for players to win, Chests of Plenty includes a handful of additional game features. Those features are namely two bonus games and a link to a progressive jackpot, and are all related to two different scatter symbols. 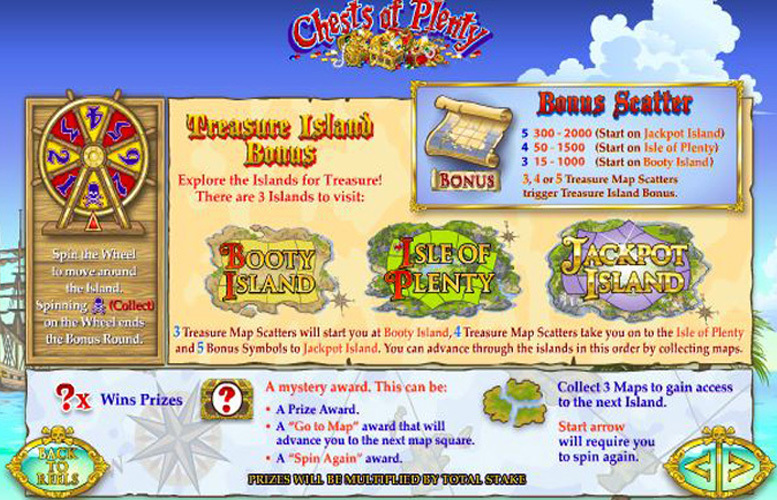 If three, four or five of the Chests of Plenty treasure island scatter symbols appear anywhere on the reels, it triggers the treasure islands bonus round. In that round, players can explore three islands in search of both buried treasure and of passage to the most valuable jackpot island. Which island a player starts on depends on how many scatters triggers the round and movement is achieved by spinning a wheel. If a treasure chest scatter appears on reel one, three and five at the same time, the slot’s second bonus feature is triggered. That feature sees each chest zoom out and reveal a trio of gemstones from within. If the gemstones match it results in an instant payout and if each chest reveals three matching diamonds on the same draw, the player wins the Chests of Plenty progressive jackpot. As well as making up the highest paying payline combination in Chests of Plenty, the slot’s female pirate wild also substitutes for all other symbols apart from the scatter. What’s more, if the wild appears horizontally next to a male pirate symbol it transforms that symbol into a wild too. Away from the slot’s wild and scatter symbols, its regular symbols depict either letters of the alphabet or characters and things you’d likely find on a pirate ship. It is the latter type which are more valuable, and the most valuable of all – aside from the wild – are the male pirate symbol, the cutlasses symbol and the parrot symbol. Five of the male pirate symbols along an active payline results in a payline jackpot worth 2,000 times the player’s chosen line bet. Five of the cutlasses or parrot symbols similarly arranged, meanwhile, pay out at a rate of 1000 and 500 times the bet per line, respectively. Compared to the vast majority of other available slot games, the range of stake options which Chests of Plenty provides to players is a little disappointing. All 20 of the game’s paylines are all always active, after all, and there are only a small handful of possible line bet sizes to choose from. A player’s line bet, in fact, must be between a minimum of 1p and a maximum of just £1, meaning that the overall staking limits per spin are 20p at the lower end and just £20 at the upper end. Any players who like to bet more than that, therefore, are likely to be dissuaded from playing Chests of Plenty. One of a large number of slots which utilises a pirate theme, Chests of Plenty takes better advantage of that theme than most. The game’s bonus features, after all, are really fun and are sure to get players feeling every inch like Long John Silver, Blackbeard or whoever their favourite pirate is. Those bonus features, too, have the notable added bonus of introducing a few extra ways in which players can win through Chests of Plenty. Instant wins through each feature are generally nicely sized and the treasure chest bonus has the added advantage of being linked to a potentially life-changing progressive jackpot. When it comes to the slot’s general payline jackpots, however, it is unfortunately a different story. With a highest possible jackpot of £20,000, after all, Chest of Plenty’s payouts are far from the most generous around and are in truth a little disappointing. Alongside that, the slot also disappoints when it comes to its available staking options. This game has a rating of 4 / 5 with 819 total reviews by the users.